A.P. 2802C. The Rocket Racket - An A.B.C. OF R.P. Firing. Restricted (For Official Use Only). P/b, 20 x 15cm. 28p, Air Ministry, Sept. 1944. 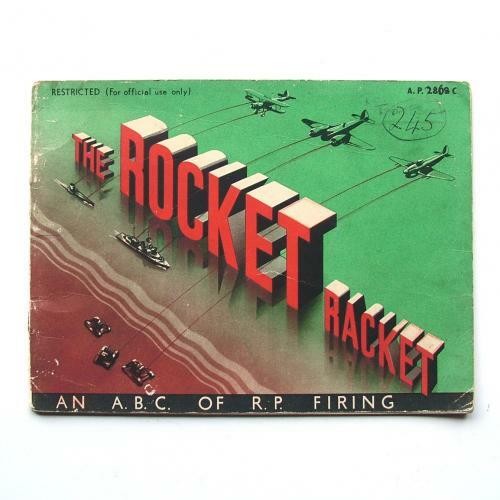 A booklet explaining the various factors to be taken into account when firing rockets from aircraft. It describes the rocket's motion and the main differences between a rocket and a shell. It also explains what effect these differences have on the sighting problem. Written in easily understandable language with cartoon drawings etc. The cover is a bit gubby and dog-eared with some annotation. Inner pages generally good. Excellent little booklet. Stock code P21609.